LIFT TOWABLE 50 FOOT GENIE TZ 50/30 Rentals Ft. Collins CO, Where to Rent LIFT TOWABLE 50 FOOT GENIE TZ 50/30 in Ft. Collins, Wellington, Greeley, LaPorte, Loveland, Windsor CO and all of Northern Colorado. 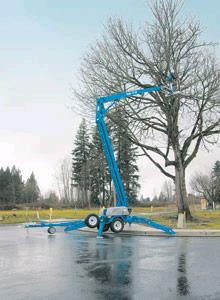 Hydraulic outriggers, Automatic leveling system up to 10 degrees. AC Wiring to the platform. 359 degree rotation. Outrigger footprint 14'4"" wide 14'4"" long. Weight 4400 lbs Stowed width 5'6", height 6'10", length 23'6"
Tongue weight 400 lbs, 2" ball required to tow, 60 mph max tow speed. A Saftey harness is required, and is available for rent or sale. For your safety avoid using in windy conditions. 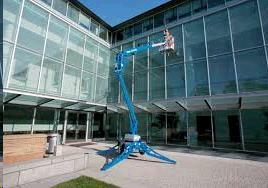 * Please call us for any questions on our lift towable 50 foot genie tz 50/30 rentals in Fort Collins, Wellington, Greeley, LaPorte, Loveland, Windsor CO and all of Northern Colorado.